We want your feet to be happy! Our mission is to provide relief of foot and ankle pain in a caring manner and prevent health problems which affect the feet. We accomplish this by providing quality and comprehensive treatment plans comprised of listening to our patients, respecting their concerns and coordinating the necessary services to promote good health and total wellness care. We carry out this mission by fostering and supporting both traditional Western and holistic medical treatments. Your feet take a tremendous beating everyday. They hit the ground up to 7,000 times a day bearing one and a half to five times your bodyweight. Although the foot is wondrous in design and function, the foot can be struck by various ailments and deformities. This is because some may be life-threatening. Podiatrists are often the first healthcare professional to diagnose these disorders. Many serious illnesses such as diabetes, poor circulation and arthritic problems are first detected in the foot. 3) Provide surgical intervention when necessary. There is always a personal touch to our service. We listen. Our staff deals with patients directly — an answering service is never used. The doctor is also available and easily accessible to answer patient questions and concerns. Home visits are taken by appointment and she also occasionally addresses foot concerns on our Blog. For your convenience, we offer in-office services including standard and fluorescent X-rays, circulation testing and treatment, physical therapy (ultra sound, microvas and paraffin), custom molded orthotics, diabetic shoes and in-office surgery. Feel free to schedule your appointment by sending an email or contacting the office at (708) 481-FEET (3338). Our friendly, caring staff are eager to serve you! Dr. Terri Foster is a graduate of the University of Osteopathic Medicine and HEalth Sciences, College of Podiatric Medicine and Surgery in Des Moines, Iowa. She received her baccalaureate degree from Bradley University in Peoria, Illinois. Dr. Foster completed a post-graduate training program at the Foot & Ankle Rehabilitation Center in Hazel Crest, Illinois. Dr. Foster became interested in Podiatric Medicine while working with a Podiatrist part-time during high school and during her summer breaks from college. As such, she feels that she bridges the gap between "old fashioned" treatment techniques and contemporary treatment options. 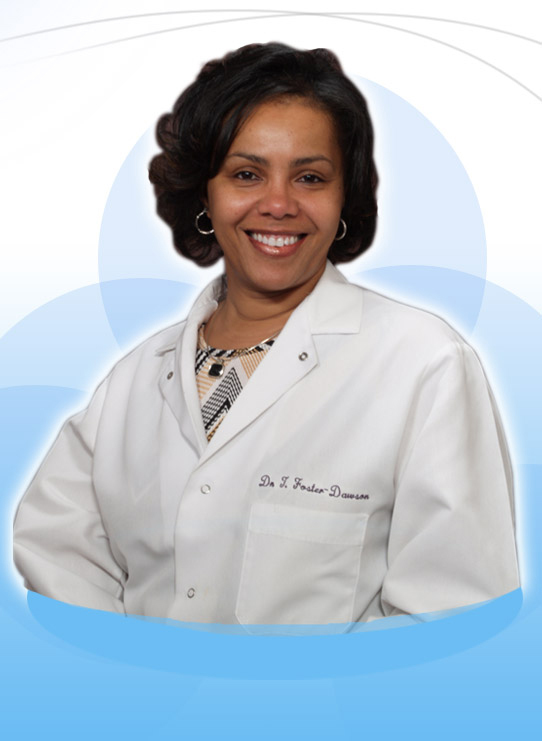 She has served the South Suburban and Chicagoland area for over 22 years with an emphasis on prevention and educating her patients. She also maintains a philosophy of exhausting conservative therapy and treatment options as an alternative to surgery being the first recommendation. Her affiliations and accomplishments include, Former President and Secretary, as well as, current member of the Cook County Podiatric Medical Association, Board Member of the National podiatric Medical Association, Member of the Academy of Ambulatory Foot and Ankle Surgeons, Olympia College Advisory Board and South Suburban PADS Volunteer Podiatric Physician. Cindy is the Office Manager and primary scheduler for the Foot & Ankle Wellness Center. Cindy also schedules all home visits. If you have any billing questions she can assist you with that as well. To speak with Cindy or schedule an appointment, call the office Monday through Friday at (708) 481-FEET (3338). Tamika is the Office Assistant and Vascular Technician for the Foot & Ankle Wellness Center. If you need to schedule a Vascular exam, Tamika is your go-to girl. To speak with Tamika, call the office Thursdays or Fridays or leave a message anytime and your call will be answered within one business day.